More than half of the global seafood supply comes from aquaculture, or fish farming. Learn more about its increasingly important role in the global food supply. Marine aquaculture, mariculture for short, is the farming of marine organisms (fish, mollusks, crustaceans, and aquatic plants). Marine aquaculture can take place in the ocean (in cages, on the seafloor, or suspended in the water column) or on land in manmade systems, such as ponds or tanks. Aquaculture is not new. It has been practiced in some parts of the world for thousands of years. The application of modern technology to marine aquaculture is relatively new, but is successfully practiced around the world. 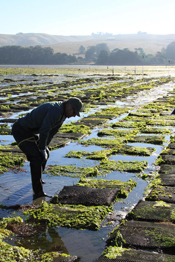 Here in the U.S. we farm a variety of marine species, including mussels, oysters, clams, abalone, seaweed, and salmon. Seafood is the primary source of protein for more than 3 billion people on the planet and is widely recognized as contributing to a healthy diet. A desire for seafood, coupled with growing and more affluent global populations, has created a dramatic increase in seafood demand. Wild-capture fishery harvests have remained essentially flat since the late 1980s and have been unable to satisfy growing demand. Since then, seafood consumption has roughly doubled, due largely to increasing production of farmed fish, shellfish, and aquatic plants. As it has for the past 25 years, aquaculture will play a substantial role in meeting society’s need for increasing food supplies into the future. The global population is expected to reach nearly 10 billion by 2050. Today, at a population of just over 7 billion, traditional land-based agriculture consumes more than half of all developed land and more than 70 percent of the world’s fresh water resources. Despite this, more than 800 million people are chronically undernourished. The ocean covers more than 70 percent of the Earth’s surface, yet capture fisheries and a small marine aquaculture sector produce only two percent of the global food supply. There is great potential to reduce pressure on land-based resources by farming fish in the ocean. Marine aquaculture offers many environmental benefits, relative to other forms of animal farming. Aquaculture operations in the marine environment typically have a smaller carbon footprint, use less land and fresh water, and are more efficient at converting feed than beef, pork, and poultry. Aquaculture also has the potential to reduce pressure on wild fisheries while increasing the availability of healthy protein. Why should we expand marine aquaculture in the U.S.? The U.S. imports more than 90 percent (by value) of its seafood, more than half of which is from aquaculture. The annual seafood trade deficit in the U.S. exceeds $14 billion and is among the largest commodity trade deficits in the country. In 2014 U.S. aquaculture production contributed just under 0.5 percent to the global farmed seafood supply, while Asia produced almost 90 percent, most of which was from freshwater farms in China. Reliance on imports can be problematic. Increasing wealth in countries like China and Brazil result in higher domestic demand for healthy seafood they produce, making less available for export to countries like the U.S. Heavy reliance on imported seafood can also increase the risk of sourcing from farms that engage in practices that are destructive to the environment and/or local communities. There is potential to develop a sustainable, robust, and diverse marine offshore aquaculture industry in the U.S., which has the largest exclusive economic zone (EEZ) of any country in the world. The U.S. also has the most area suitable for aquaculture production in the marine environment in terms of desirable water depth, current speed, and access to coastal infrastructure. Farms operating in U.S. waters are subject to some of the most comprehensive environmental, seafood safety, and regulatory programs in the world. The U.S. has the science and technology to launch this industry and the research capacity to solve problems that may arise, facilitating use of adaptive management to move this entire industry forward in a responsible manner. What are some of the environmental issues and concerns associated with marine aquaculture? Aquaculture production in the offshore marine environment is not without its challenges. Fish are raised in an open system that can have serious consequences for ocean ecosystems if they are not sited, designed, and managed properly. There have been numerous examples of poor production practices that have impacted the surrounding environment. Potential impacts to surrounding ecosystems include the transfer of disease from farmed to wild stocks; the use of chemicals and antibiotics to treat disease and parasites; excess nutrients that can impact the biodiversity of benthic habitats; the release of and interaction with non-native species that compete with native species; and overfishing of wild fish required to feed the farmed fish. While these are all relevant concerns, research has shown that proper siting and husbandry practices, best management practices, and the use of appropriate technologies and tools result in greater productivity while greatly minimizing and potentially eliminating some of these stressors altogether. In the case of feed, for example, significant investments have been made towards the research and development of more efficient feeds that require fewer wild fish to feed farmed fish and in some cases, have been eliminated the need for wild fish altogether. Nearshore (oysters, clams, geoduck) Typically found in bays and estuaries, nearshore mariculture in the U.S. consists of a diverse group of shellfish species. Offshore (finfish, mussels, algae) Found in deeper water depths, offshore aquaculture is a growing sector with primarily finfish, mollusk, and algae species. Onshore (algae, abalone, shrimp, keyhole limpet etc.) Diverse in terms of species and techniques, onshore mariculture ranges from food production to medical research and biofuel creation.